Nations need to significantly strengthen the Paris pledges for emissions reductions between now and 2030 in order to limit projected warming below 2°C (3.6°F), according to new analysis released from Climate Interactive and MIT Sloan. More than 150 nations are expected to sign the Paris agreement on April 22. However, full implementation of the current pledges would result in expected warming by 2100 of 3.5°C (6.3°F). Deeper, earlier emissions cuts are needed to limit warming to no more than 2°C. The Paris Agreement provides a mechanism for the nations of the world to increase their commitments through its “global stock-take” provision, under which nations can submit stronger pledges by 2020. Figure 1: Greenhouse gas emissions for several scenarios with required annual emissions reduction rates. The Climate Scoreboard analysis from Climate Interactive and MIT Sloan shows that with each year that countries wait to strengthen their current pledges, the rate at which emissions must decline gets steeper and steeper. If countries only fulfill their current Paris pledges by 2030, our energy infrastructure, agriculture practices, and consumption habits will need to change prohibitively fast after 2030, lowering the chances of achieving the Paris agreement goal of limiting warming to no more than 2°C (and aiming to stay below 1.5°C). Between the impacts of climate change and the dramatic shifts in our economies if we delay, stronger action now is essential for a more secure future. If the Paris pledges are improved as shown in the Ratchet Success scenario in Figure 1, then global emissions peak by 2020 and the rate of decline required to limit expected warming to the Paris goal is 3.2%/year, a rate that has been achieved by some nations in the past. If countries adhere to their Paris pledges, and then strive to meet the 2°C limit with stronger cuts after 2030, then global emissions would have to peak in 2030 and then decline 4.6%/year thereafter, a rate that would strand many fossil fuel assets (see the “Delayed Ambition scenario in Figure 1). 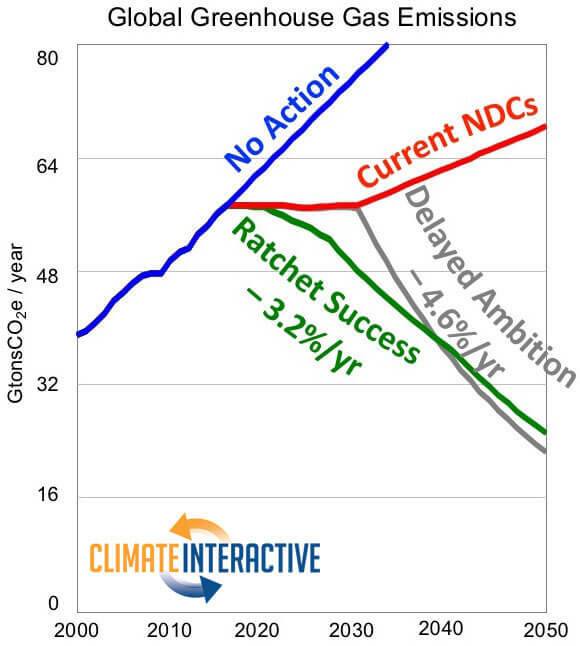 The “Ratchet Success” scenario shows that, to have a roughly 2 in 3 chance of limiting warming to no more than 2°C, global greenhouse gas emissions would peak in 2020 and fall thereafter, yielding expected warming by 2100 of 1.8°C (3.2°F), with a range of uncertainty from 0.9 to 2.4°C (1.7 to 4.4°F). China would commit to peaking emissions by 2025, not 2030. Other developing countries would commit to a peak by 2027. The U.S. would pledge to reduce emissions 45% below 2005 levels by 2030, improving on its Paris pledge of a 26% drop below 2005 levels by 2025. The other developed countries would match the 45% pledge. The EU would pledge to reduce emissions 47% below 1990 levels by 2030, improving on its Paris pledge of a 40% cut below 1990 levels. Table 1: Current and required pledges to limit warming below 2°C. Climate Interactive’s Climate Scoreboard analysis of the current Paris pledges (“Current NDCs”) found that if, fully implemented, without further action, the Paris pledges would avoid about 1 degree Celsius of warming from business-as-usual levels, but this still puts the planet on a trajectory to 3.5°C (6.3°F) of expected warming in 2100, with a range of uncertainty from 2.1 to 4.7°C (3.7 to 8.4°F). 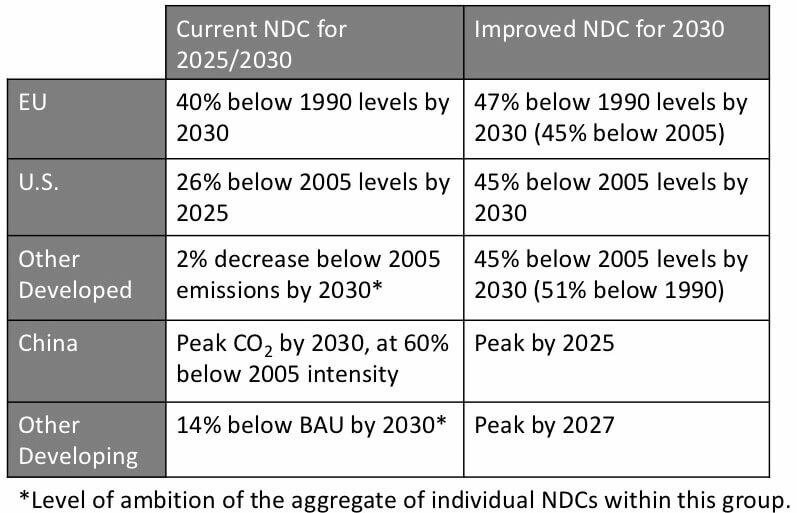 Figure 2 captures current pledges and improvements needed in 2020 required to limit warming to below 2°C (3.6°F) for five regions of the world. 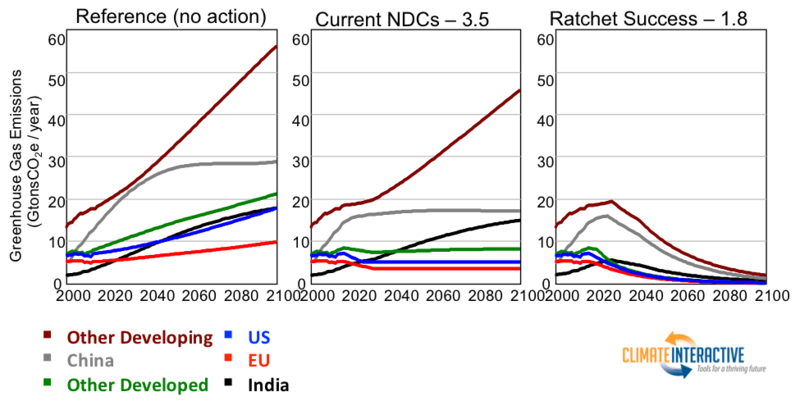 Figure 2: Greenhouse gas emissions from 2000-2100 for six regions of the world, under three scenarios. The Climate Scoreboard analysis is produced by Climate Interactive in partnership with the Massachusetts Institute of Technology Sloan School of Management (MIT Sloan). The Climate Scoreboard analyzes the nationally determined contributions (NDCs) put forward to the UN climate talks. The Scoreboard is calculated with the C-ROADS (Climate-Rapid Overview and Decision Support) computer simulation, which is calibrated to the Intergovernmental Panel on Climate Change’s (IPCC) Fifth Assessment Report results. C-ROADS is downloadable and available for public use.